The name of the author is not one to jump out in a flash of celebrity recognition. James Hayes is not a parader of any theory and there is not an ideological bone in his body or in his book of 378 pages. He is the backbone of theatre culture, the jobbing actor at, or near to, its hub decade on decade. His subtitle is “50 Years on the Stage”. 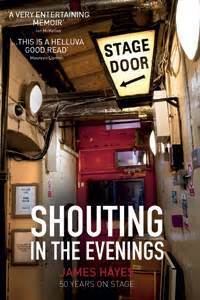 As for the title itself only Britain would publish a title like “Shouting in the Evenings.” It is a reminder of why I troop out once weekly, why it feels a privilege to be observer of people who work vastly harder than I. Later he qualifies this. “I have often felt that Michael is the greatest hit-or-miss director in England.” (That “England”- sic.) “When his productions work they are a joy to be in and behold. Goldoni's glorious comedy”- this was the “Venetian Twins”- “gave him a wonderful opportunity to exercise his outrageous sense of fun and anarchic sense of comedy.” Bogdanov was in Wales ten years ago with Goldoni (reviewed June 2007) and Hayes is absolutely right. The memories of delight from that production still run high. But let us not forget the yin and yang of this mercurial talent. That season's “Romeo and Juliet” also evokes powerful memories of another temper altogether. The vivacity of “Shouting at the Audience” starts on page 2. Hayes is doing Pirandello at the Lyttelton. Hytner wants him for a four minute extract from Peter Nichols' “the National Health” in the Olivier. It is scheduled for 9:15 and the curtain comes down on the Pirandello at 9:10. That is five minutes to get from upstanding Italian bourgeois in three-piece woollen suit to pallid bed-bound patient in wynceyette pyjamas. The recounting of productions are fine-grained in detail. The Beckett estate is notorious for its protection of its Grail. The team wonder if its custodians will tolerate a breaking of wind in a production. Samuel never wrote a fart in his text but they get by without the guardians striking it out. Actors are the most scrupulous of observers and he notices a particular gesture in Trevor Nunn. He puts one arm over his shoulder and scratches the same point on his back. It is so perpetual that it has removed all the dye at that point from his habitual denim. Hayes is later onlooker at a cultural collision. Two German directors are working with a British company via translators. They differ over the length of a pause. Christopher Plummer to the translator: “tell them I left a f***ing pause big enough to drive a f***ing horse and cart through.” Translator hesitates. “Tell them!” The rehearsal collapses entirely and Olivier is required to mend the director-actors fissure. There is a fine metaphor in there. The acting life is long and it all starts for Hayes in June 1963 with the twenty-two year old departing Limerick station. He describes the difficult self-application of Leichner make-ups. His London is a far-off time, that of Watneys Red Barrel and Mateus Rosé but also Charles Marowitz, Peter Terson and Peter Cheeseman. The days between Christmas and New Year, for those not on a pantomime stage, are a strange time of year. I cannot imagine a nicer book to curl up with than this one.